The Harmar AL100 scooter lift's quality features, construction and durability make it one of the most popular outside lifts on the market. The unique hold-down foot automatically secures virtually any scooter without any necessary scooter modifications. 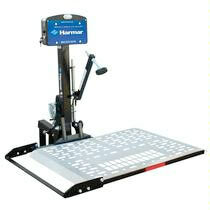 This fully automatic lift offers simple, nearly effortless operation and a hefty 350-pound lifting capacity. Also available as the AL100HD with a 400 pound capacity. The Swing Away option provides easy access to the trunk or lift gate of any vehicle.